I have been daydreaming about this neat piece of bicycle from the meatpacking district of copenhagen. 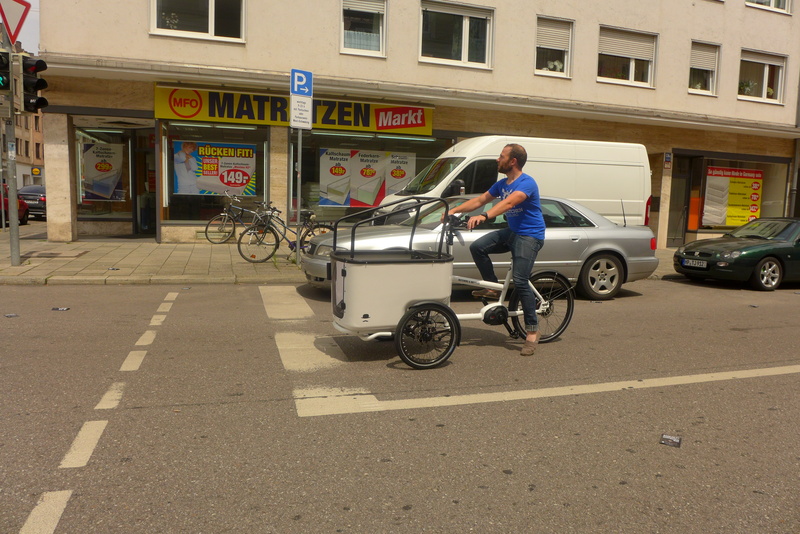 I have been nagging Jess about how much I would love to try this cargo bike, that combines tricycle and two wheeler like no other one. And finally, last weekend, I had the chance to take the butchers and bicycles MK1-E for a short spin. We packed the whale, squeezed it into the train and went for a family day trip to Munich, the self-announced cycling capital of Bavaria. 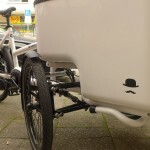 A nice and well equipped cargo bike store promised to ease my urgend need to get my hands on the most beautiful (tilting) cargo tricycle the market has to offer. 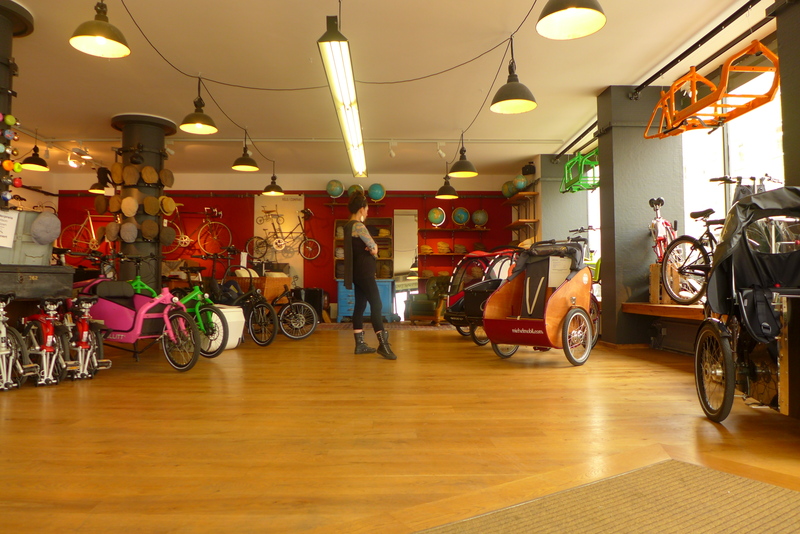 After a short talk Florian, the owner of the livingroom like bikeshop called velo/company handed over the keys and asked if I ever rode a tricycle. “Well, forget about what you know, and maybe leave the assist switched off for the first try” was his friendly advice. 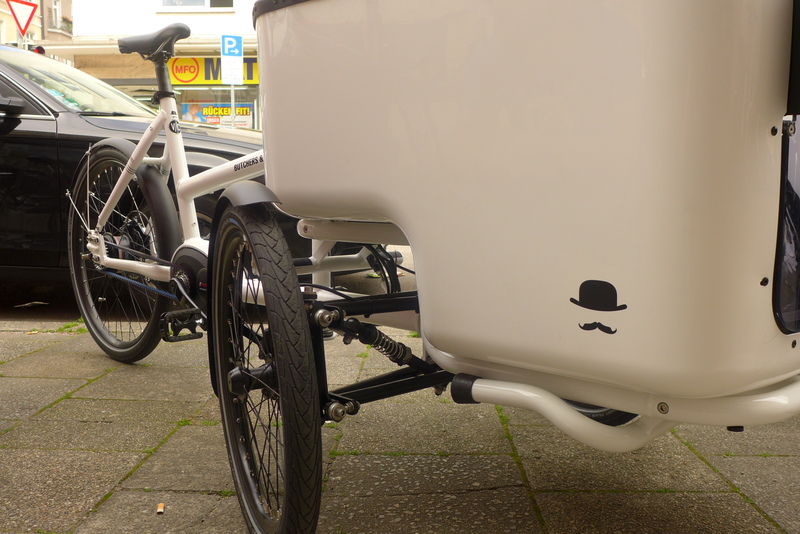 Having ridden a nihola and a Christiania before, I was careful when accelerating the bike for the first time. The stiff aluminum frame and the carbon drive transformed my legs’ pressure into decent speed in no time. I tried some careful turns. Easy. Now it was time to go a little further. The 2nd generation Bosch Performance line comes with a seamless handlebar controller. No need to take the hand of the bar in order to switch on the assist or change between it’s four clearly defined modes: eco, tour, sport, turbo. I will not tell you again, how harmonically the Bosch works together with the Nuvinci hubshift with continuously variable transmission. This drive fits just perfect into the dynamic concept of a tilting triycle. Wait; It tilts? Yes it does. It is fun leaning the bike into corners and pushing it forward while riding out of the saddle. 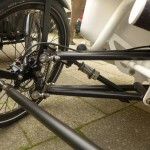 With only little limitations it almosts behaves like a two wheeler, giving you the possibilty to use your legs’ power as you are used to do and go through turns at a level of speed which can definetly be considered fun. After a short ride we had a closer look at the bike. The workmanship looks just fine and you see, that the makers where lovers of bikes and details: The door of the box closes nicely with a smooth mechanism, the lid of the storage behind the bench is equipped with straps capeable of holding papers, phones, wallets, and even a cup. 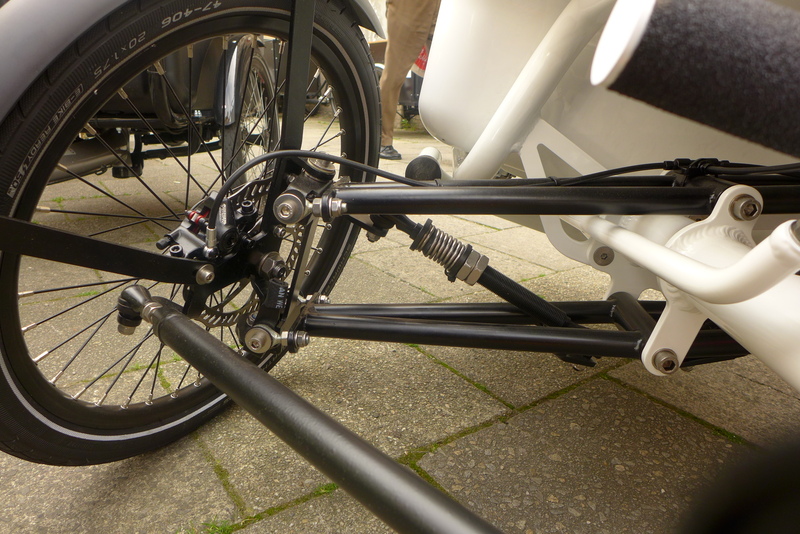 The brake is an Avid “Twin” which is a hydraulic discbrake, specially desinged for tricycles. 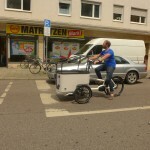 Many more nice features are on the list of options you can order with the butcher’s bicycle. Like for example the light system for additional 300.-€, which consists of two(!) supernova E3 v6s lights, each with 165 Lumen. Another optional feature is the kids bench, which to be honest, I would expect to be included in the basic equipment. It is functional for two toddlers, or thanks to isofix one baby in a carseat. Sadly this is exactly the feature where the butchers lost Jess and me. In our current situation the bike wouldn’t work for us due to the fact, that the isofix adaptor almost uses up the entire box. We would have to wait, until Nicolai is completely outgrown the box (fingers crossed) and Anouk is completely outgrown any kind of carseat (not too soon). 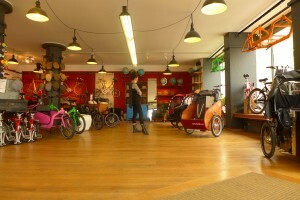 -But then: Why get a tricycle for just one kid? -simple: just for the fun of it! If you have only one kid (even a newborn), or two toddlers the butcher might work for you. 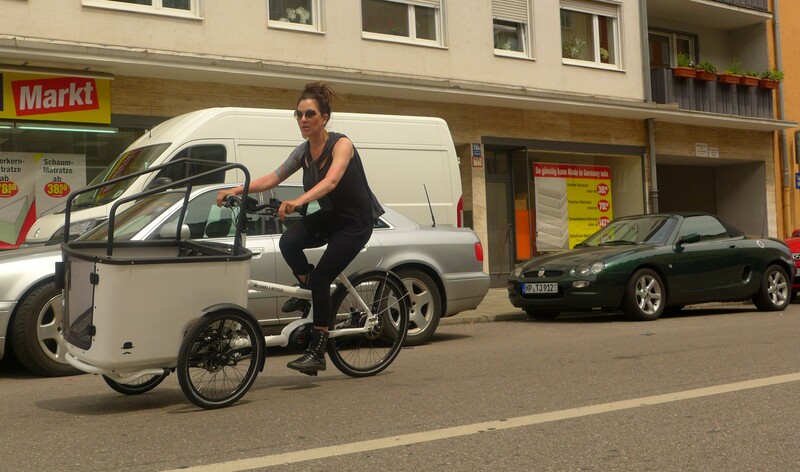 If this is the case you can definetly enjoy a sporty cargo and family carrier, which blends the original sexappeal and dynamic of a bicycle into the safe environment of a tricycle. I will still go on considering it -even if it seems a bit small on the first glance. I love this bike. I’d instantly go and have one, if it wasn’t for me having three kids (already). It’s too small for us.